This is Burma, and it is unlike any land you know about. Kipling was right. 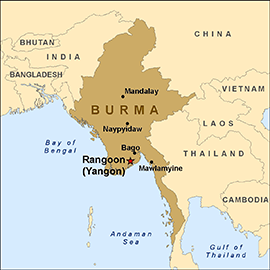 Burma (also known as Myanmar) is such a very unique and fascinating place. For years it was a pariah state and isolated from the rest of the world. As a result, it has a unique preservation of culture and landscape that has been relatively unchanged. Although there have been many political changes in the past few years and the country has opened to more foreigners, visiting Burma is still like taking a trip back in time—to South-East Asia of twenty years ago. Full of rarely seen sights—beautiful landscapes, magical temples, gilded Buddhas, tranquil lakes, men wearing men skirt-like longyis (similar to sarongs), and women who brush their faces in thanakha (traditional make-up and sunscreen)—Burma still is a world apart. 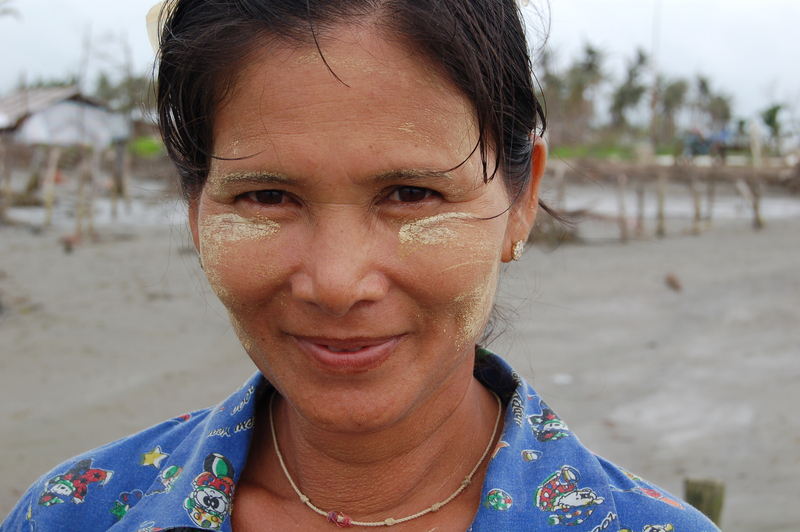 I went to Burma on assignment in 2008, just after the devastating Cyclone Nargis. It was one of the deadliest storms in recorded history. Although I found much destruction, I also found much beauty—a land filled with breathtaking sights, the serene spirituality of Buddhism beliefs, and some of the kindest and friendliest people I’ve ever met. There were a lot of things I saw and experienced during my two trips to Burma that year, and now I look back at my photographs and wish I captured more. My photos bring me pleasure in knowing that I was fortunate to learn about a beautiful land and people, but the gaps are a reminder of the many things I missed. I wish I had asked more questions, taken more notes of my impressions, and taken more (and different) photos. I should have been more mindful of my environment and short time there. Lesson learned. One thing that I certainly remember is Burma’s rich, varied and tasty cuisine which uses a repertoire of ingredients not found in any other cuisine. Rice is the center of Burmese cuisine and meats, fish and vegetables—often quite spicy and very flavorful—are served alongside. 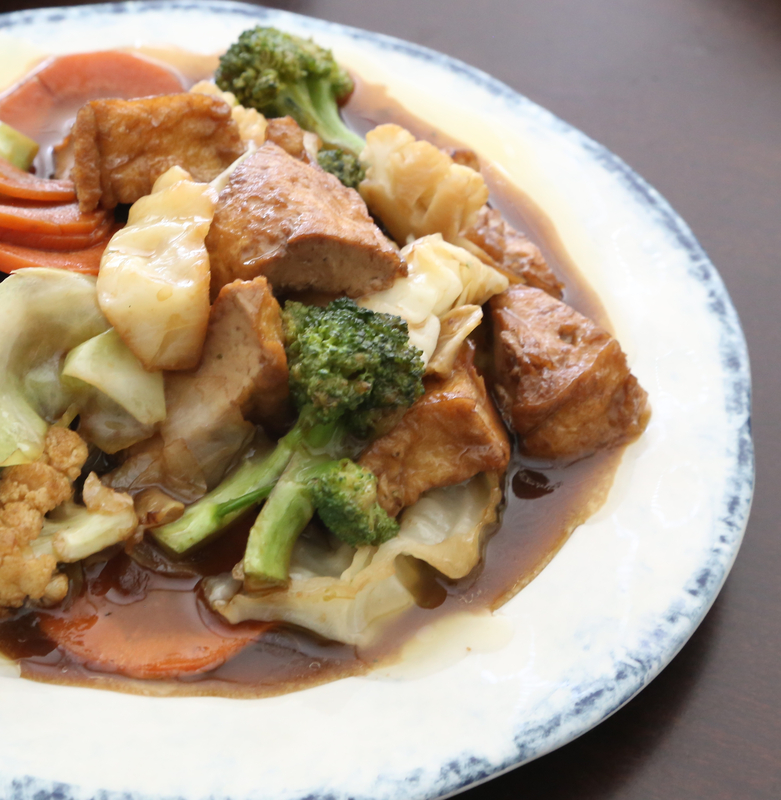 As a vegetarian, it was quite easy for me to find delicious vegetarian meals. 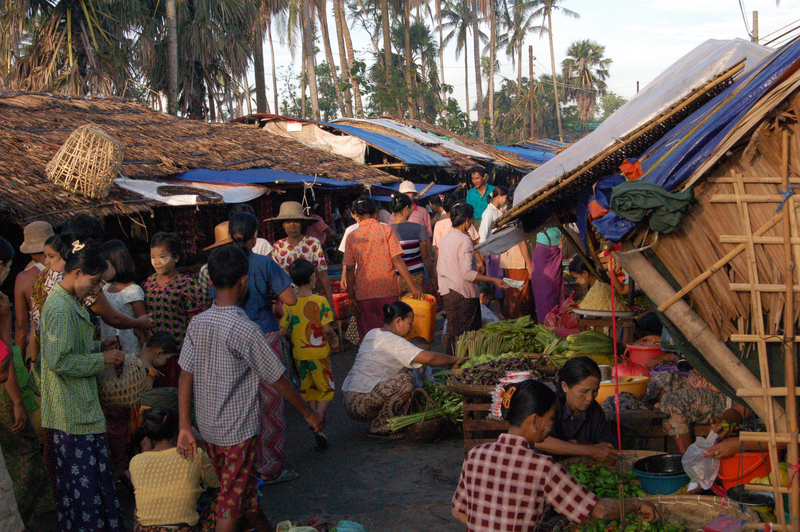 Due to its geographic location, Burma’s cuisine is characterized by a unique blend of Burmese, Chinese, Indian and Thai influences. 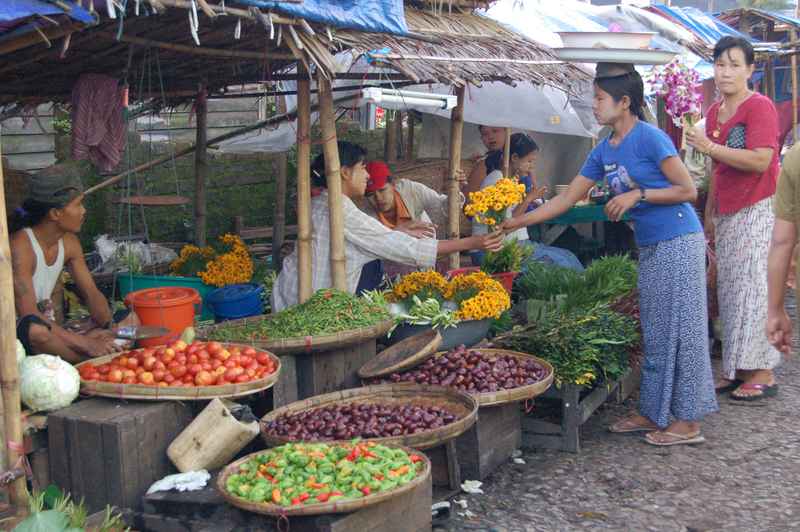 Largely plant and seafood-based, an effort is made in Burmese cuisine to balance the four basic tastes: sour, salty, spicy and bitter. Since I’ve been back from Burma, I’ve had the pleasure of eating Burmese food at Mandalay Restaurant & Cafe, a family owned restaurant just outside of Washington, D.C. My husband, son and I love their tofu with tomato and cilantro. Absolutely delicious! 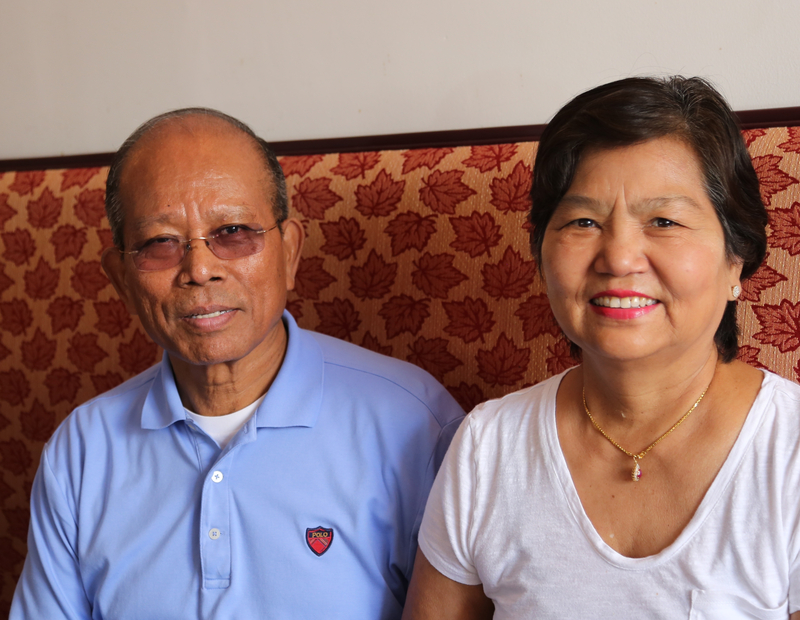 Have you always been in the restaurant business, even back home in Burma? Actually no, I used to work for the military in Burma. When I moved to the U.S. I worked as a driver for the Portuguese Embassy. How did the idea of opening a restaurant come about? When my eldest son was in college he knew of a very popular doughnut shop in College Park, Maryland that was about to go out of business. One day he said to me, “dad, we should buy the doughnut shop.” It cost $70K, just for the business, not including the building. That was a lot of money! I asked him if he knew anything about making doughnuts and he said no. So I told my son to go to the owner of the doughnut shop and ask him [the owner] to teach him [my son] all he could about doughnut making. My son learned quickly, and after a few months we bought the doughnut shop. The business went well. We sold doughnuts and were very successful. But with doughnuts, business is mostly in the morning. You saw an opportunity to grow your business? 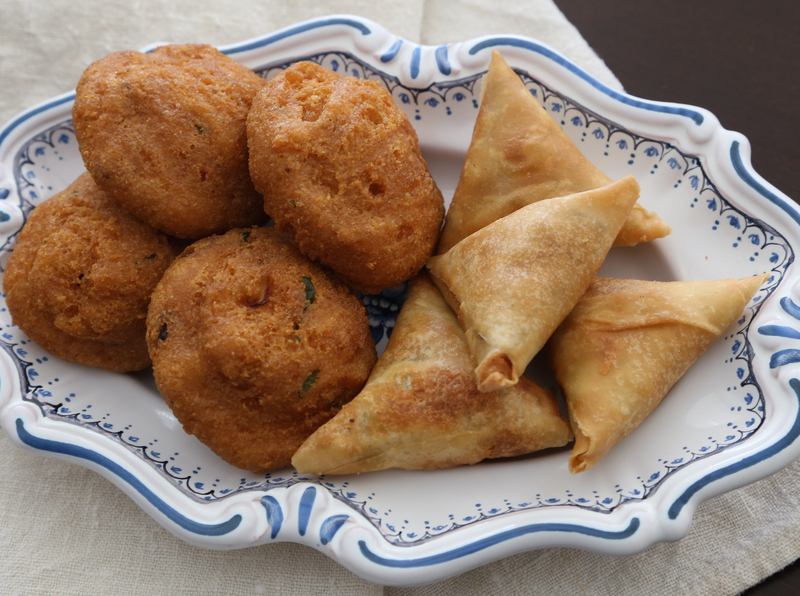 Yes, after a year of selling doughnuts, I asked my wife to quit her job as cook at a Burmese restaurant in D.C. so we could use the doughnut shop as a Burmese restaurant, serving lunch and dinner. So you were serving doughnuts in the morning and then Burmese food in the afternoon and evenings? That sounds like a very busy time. Did you find it confusing to run two different types of services from the same place? Yes, our family was quite busy then. At the time I was still at the Embassy, so the restaurant was mostly being run by my wife and sons. We all took shifts to make it work. We were very busy. After some time the restaurant was more popular than the doughnut shop and we needed more room to serve more guests coming for lunch and dinner to eat traditional Burmese food. We decided to close the doughnut shop and turn the space into just a restaurant. How did your doughnut customers take the change? Ah, they were not happy… many were very upset with us. Some even sent angry letters, but it [closing shop] was the best thing to do for our family and the business. We were very successful with the restaurant. After five years in College Park, we moved to a larger space in Silver Spring. How do you and your family make big decisions for the restaurant? We often have family meetings. We gather together around a table and discuss the pros and cons of major decisions. There’s usually a lot of discussion, sometimes very “lively” ones. As patriarch of the family, do you have the last word? Do you make the final decision? Do you have any advice for anyone wanting to open their own restaurant? It’s very challenging and takes a lot of work. Some things are out of your control so you have to be flexible. You have to be committed and willing to work very, very hard. It sounds like it can be stressful at times. What do you do to relax and handle the stress? Five times a week, I run 43 minutes on the treadmill and I meditate. Why 43 minutes? And did you say that you meditate while running on the treadmill? Yes. Well, I used to run 80 minutes, but as I’m older now my doctor said I could slow down and that I did not have to run so long. I chose 43 minutes because that seemed like a perfect time for me—not too long or too short. It also is a great time to keep me aware and mindful of what I’m doing. At a certain time, I change pace and after another minute I change again. I’m very mindful of when I must change. I use this time to meditate. As a Buddhist, meditation is an important part of my life. Staying connected to your roots is also important to you. How do you you do that? I travel back to Myanmar often. We [my family] also have started many health and education projects in the Magwe Division, where my family is originally from. 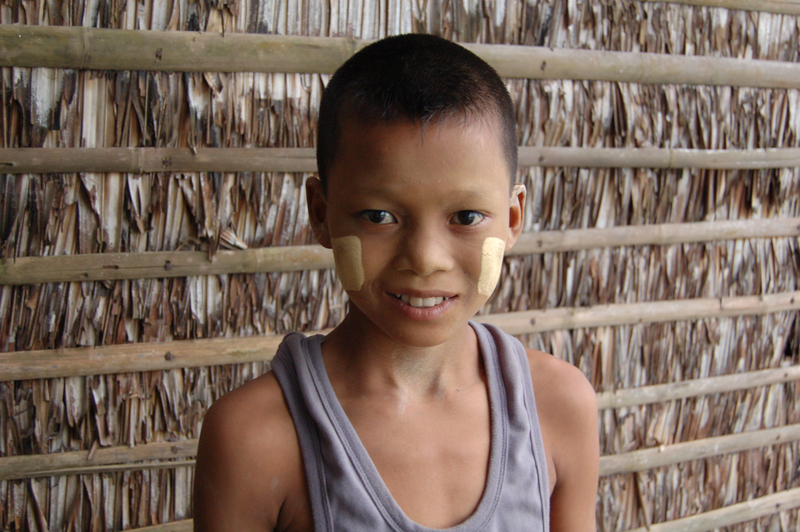 My youngest son lives in Burma to manage these projects. You were also involved with fundraising support to assist with the devastation of [Cyclone] Nargis. Please tell me about it. 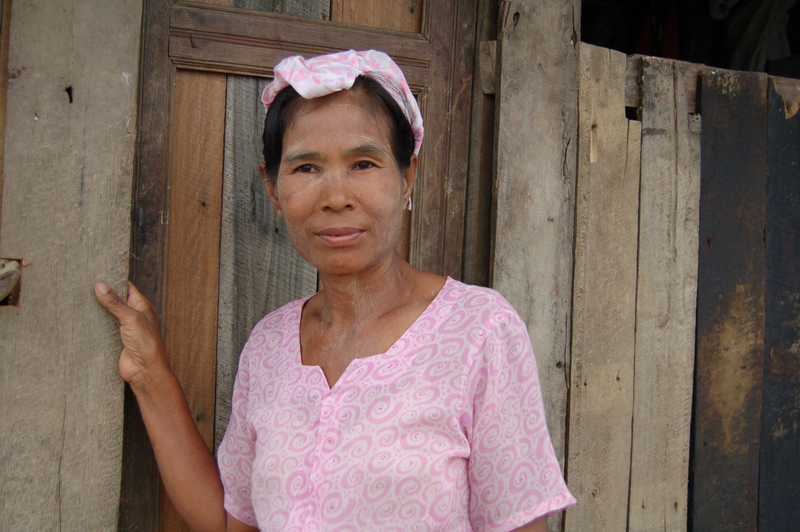 I had arrived in Burma for a month-long trip one day before Nargis hit the country. I witnessed some of the devastation. It was unlike anything I had seen before. It was terrible. As soon as my family knew I was safe, we immediately started fundraising for relief efforts. After I returned to Maryland, we held a special buffet dinner at the restaurant and also set up a donation jar in the front of the restaurant. The restaurant was so full. Over $17K was raised by our customers and friends. How rewarding it must have been for you and your family to see such a great turnout from loyal customers and friends in the community who came to support Burma. Yes, it was very nice. 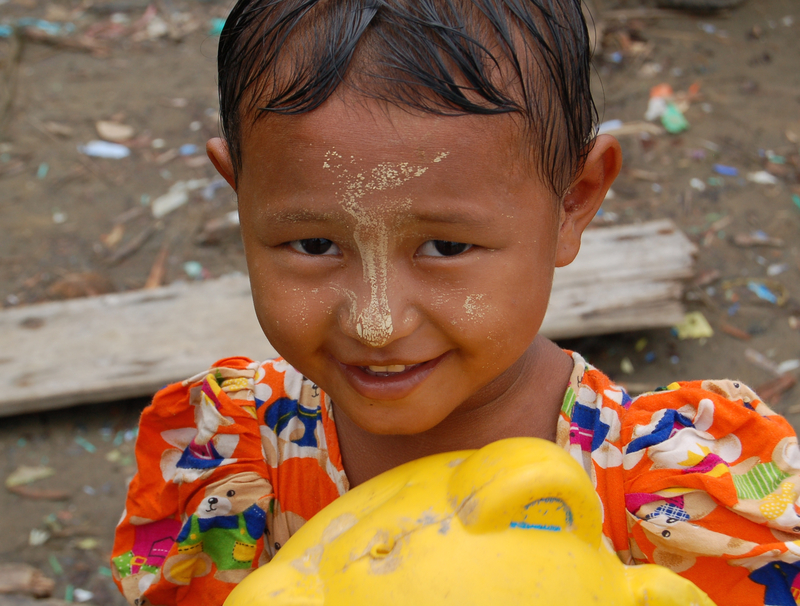 The community was so supportive and we really appreciated their willingness to help so many Burmese who were suffering. The majority of the money was donated to an Emergency Clinic for cyclone victims. The rest went to shelters that provided temporary shelter to those who lost their homes. You’ve grown a wonderful business here in the community with Mandalay. Do you feel you’ve achieved your dreams? Not yet. 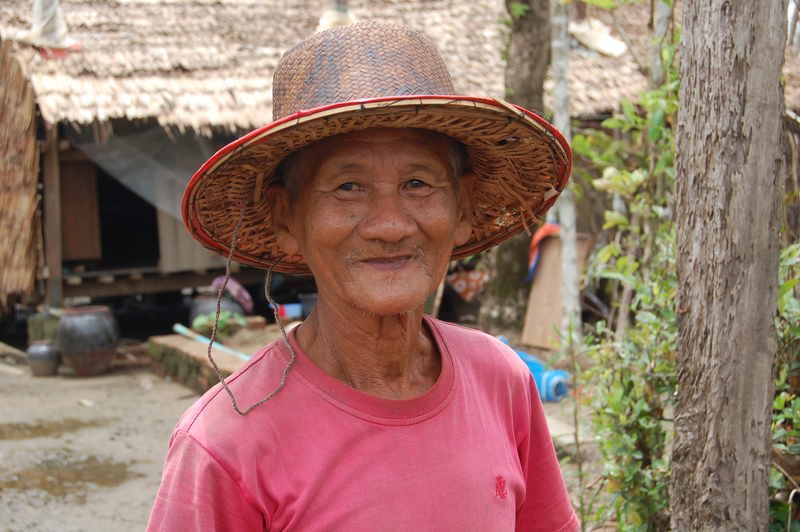 I still have more dreams for our business and for my home [Burma]. My family and I continue to work hard, dream and plan for our future. We are looking forward to accomplishing other things together, as a family. I tell my family again and again, what I want most is that our family is together. No matter what we do, family should always be first, our priority. This is my biggest dream—a family that remains close is the most important achievement. We have nothing if we do not have each other. The above is an excerpt from a longer interview I had with Saw Myint. 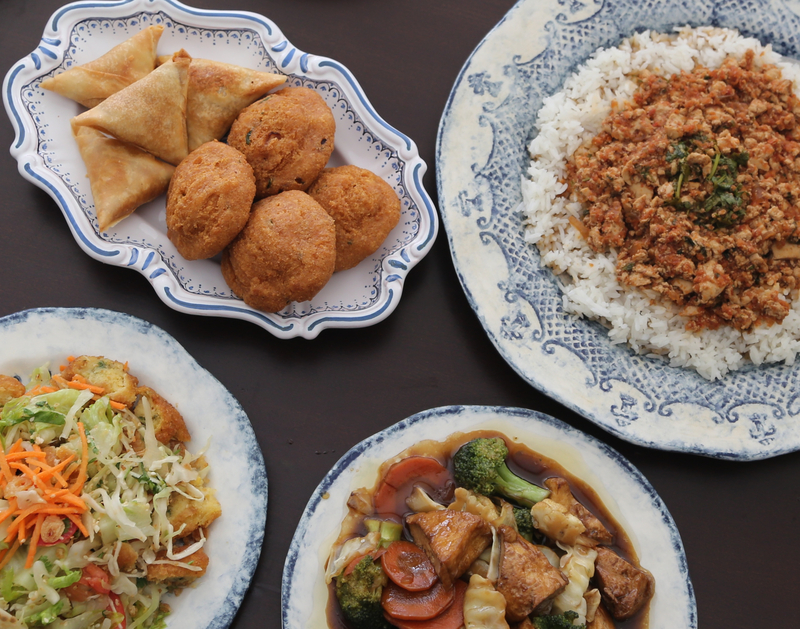 Below are a few dishes we’ve enjoyed eating at Mandalay Restaurant. Burma is one of a very few countries where tea is both eaten and drunk. 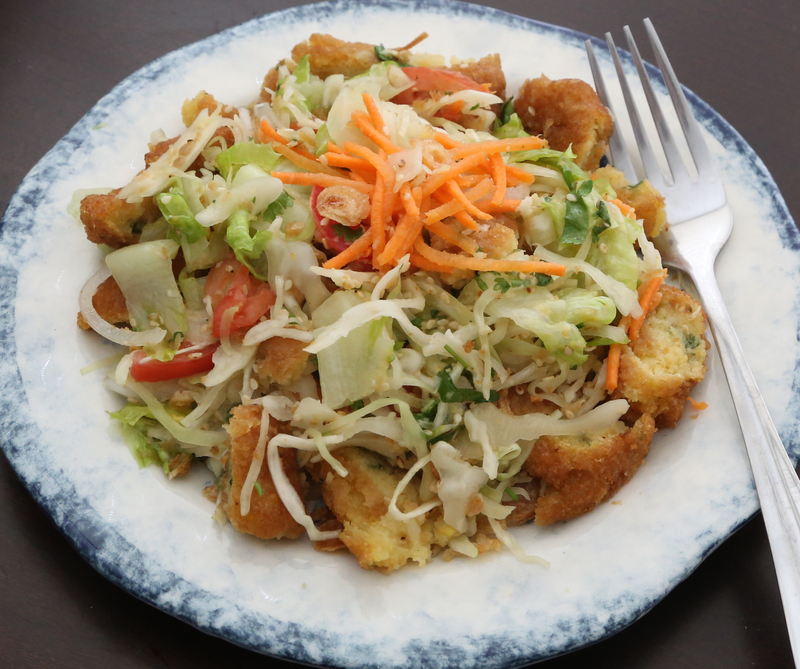 Recently, while eating out at Mandalay Restaurant, I had the pleasure of trying their very traditional version of Laphet Thoke, Burmese Tea Leaf Salad. It is made made from fermented tea leaves. 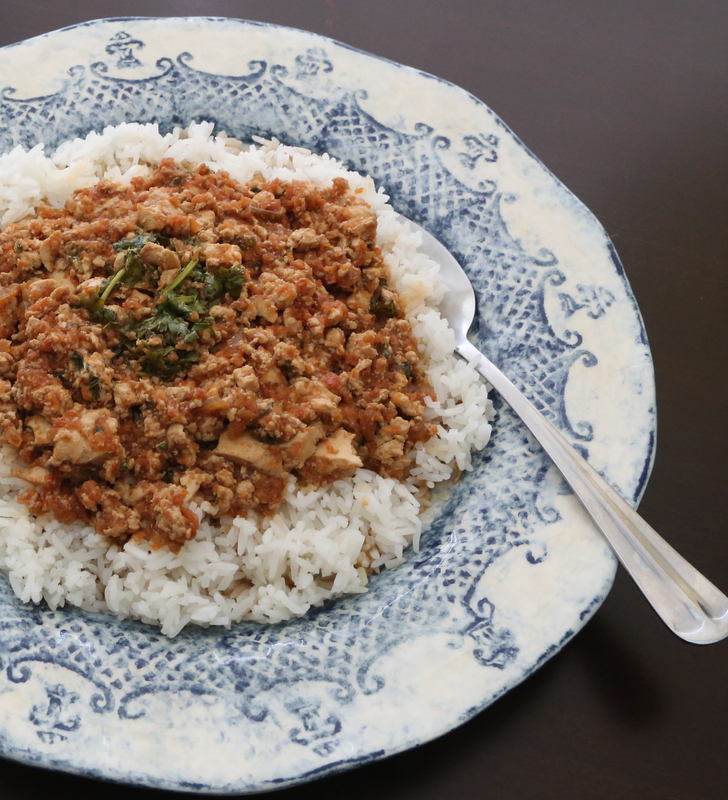 Perhaps the most known Burmese food, it is often considered by many to be Burma’s national dish. 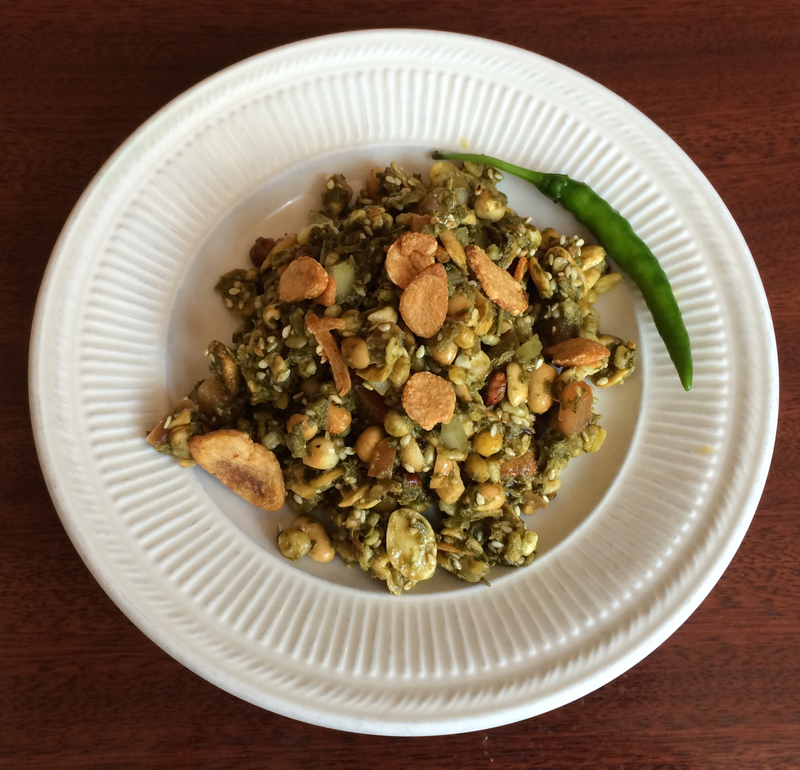 A little salty, sweet, spicy, and bitter, laphet thoke is made from a heady mix of textures and flavors that include pickled tea leaves, roasted and crispy peanuts, roasted broad beans, fried garlic, and toasted sesame seeds. The dish I had was vegetarian, but other versions can include dried shrimp. Served as an appetizer, side dish or snack, this salad is quite versatile. You can read more about it here and the process of cultivating the tea leaves here. I don’t have a Burmese recipe to share in this post, but I would highly recommend you seek out any Burmese restaurants that may be in your community. They’re not as ubiquitous as Chinese, Indian or Thai restaurants, but if you should be so lucky to find one in your area, try it out! And, if you’re ever in the D.C. area you can try Mandalay. Finally, if you’re able to visit Burma, go. It’s a world apart, and probably unlike any place you currently know. Beautiful story, beautiful photos, a wonderful post. Stories of mankind and the survival. What a precious experiences you had. We are flowers of one garden. “Flowers of one garden”, I love that. Thank you Fae. My friends, “Flowers of one garden” is what I have been thought as a Baha’i since I was a child, so I am very happy to find other believers in the same concept, even though not part of the same religion because: “Ye are all fruits of one tree, the leaves of one branch, the flowers of one garden.” Bahá’u’lláh. “Flowers of one garden” is a beautiful to sentiment to be thought as a child. Simple words, yet powerful meaning. Glad you like this post. Thank you! We recently had Burmese tea leaf salad at a great restaurant named Ruby Burma in Montreal. It was delicious! Truly love the melding of flavors in this particular cuisine. Excellent! Nice post! How wonderful that you’ve not only had Burmese food, but that you had tea leaf salad and liked it!! As you said, Burmese cuisine is delicious! When I go to Montreal I’ll be sure to look for Ruby Burma, thanks! I had Burmese food again for lunch today. I decided to take some more pictures of the different dishes I had. I’ll try to post them by tomorrow, if not sooner. Thanks again!